Seeing a mountain gorilla in the wild in the thick jungle of which they call home, is quite possibly the most privileged encounter with wildlife of all time. But it’s not exactly a ‘stroll in the park’. Mountain gorillas can only survive successfully in the wild, living amongst thick dense vegetation; therefore trekking into their native forests is your only chance of catching a glimpse of these striking primates. The world’s population of mountain gorillas has diminished to approximately 750 or so, half of them living in the thick forests of Uganda. 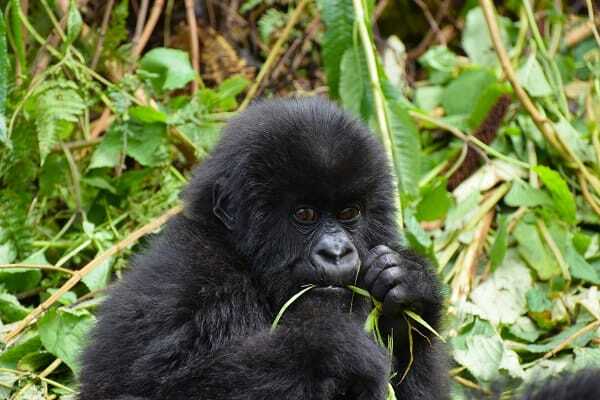 Bwindi Impenetrable Forest National Park is the most favourable for trekking to see these magnificent apes. It’s also called “The Place of Darkness” due to its geographical location in the mountains of south-western Uganda with a misty cloudy climate and very dense tree covered terrain. Bwindi Impenetrable Forest is ancient, covering 128 sq miles, and named a UNESCO World Heritage site due to its magnificent biodiversity and endangered species that reside there. As far as viewing the gorillas in their habitat, there are very strict regulations in place set by the Ugandan government and Uganda Wildlife Authority to ensure the gorillas stay healthy, wild and protected. This is wonderful. Only 8 permits are granted per gorilla family, per day. And you must also be in the company of a registered park ranger. Depending on where the families are on a particular day, it can be hard work to reach the gorillas, which requires trekking up and down hills, through thick vines, bushes and thorns. Thank goodness for the ranger as there are no paths, no signs, no directions, and most often, no clearings. This is mountain gorilla country! Mountain gorillas are considered to be highly intelligent, and communicate using a variety of sounds. They often display distinct human characteristics and are generally a gentle species. The close-knit family groups are headed by a silverback – a mature male, who can weigh up to 120kg. He’s the one to decide where the family will eat and sleep and amongst his many rights as head of the family, he’s allowed to eat first. If the family are feeling threatened in any way however, it’s the silverback who will defend them fiercely. It’s an absolute privilege to see mountain gorillas in the wild, in their own natural habitat and who knows for how much longer we’ll have this once-in-a-lifetime opportunity.